Clowns Without Borders USA has been very active in Haiti. The clowns engage in many diverse activities. In addition to holding free performances, volunteers have visited hospitals and medical clinics, refugee camps, and held training workshops for local artists, teachers, youth, and arts-based organizations. 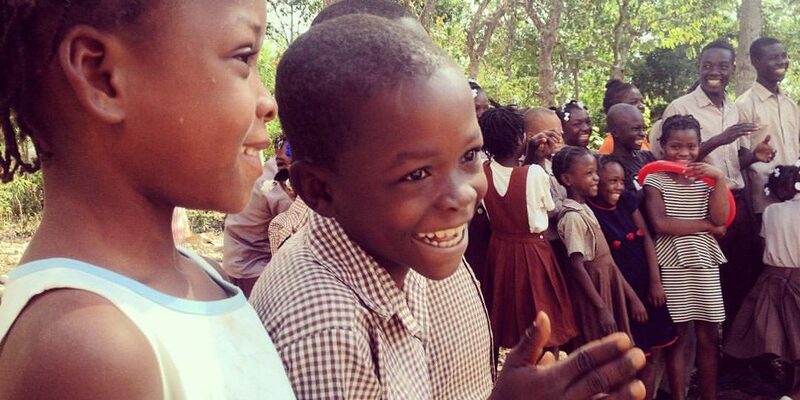 Haiti is also a location where Clowns Without Borders chapters team up to run projects together. The USA chapter has worked with CWB-Sweden, -Spain, and -Canada chapters, blending skills and styles to bring happiness to the people of Haiti. Haïti is the French spelling (‘h’ is silent) of the word Ayiti, meaning ‘land of high mountains’ in the indigenous Taino language of the island of Hispaniola, that Haiti shares with the Dominican Republic. Historically its people have seen a lot of suffering. In 1492, soon after Columbus landed on Hispaniola, claiming it for the Spanish, the natives were almost entirely killed or exported as slaves. France began a colony in the 17th century, and in 1697 was given possession of the western third of the island, now Haiti. Hundreds of thousands of slaves were imported from Africa to work in forestry and sugar-related industries. In 1804, after a slave rebellion led by Toussaint Louverture, Haiti became the first post-colonial black-led nation in the world. Over the years there have been harsh regimes and much political turmoil. Today Haiti continues also to battle poverty, lack of resources and industry, poor infrastructure, and bad weather (hurricanes, rains and floods). Most of Haiti’s population are farmers, though, sadly, agricultural productivity is low, due in part to soil erosion (from deforestation, by colonial exploitation and the local custom of making charcoal for cooking fuel). Seismic activity is also a danger: the magnitude 7.0 earthquake in 2010 killed an estimated 300,000 people, made millions homeless and destroyed a large percentage of buildings and roads. With strong Haitian determination, and help from overseas, there has been much redevelopment and rebuilding, although, in some cases, aid has received mixed reviews. Haitian people are kind, resourceful and resilient, and maintain tremendous faith. Most are Christian, some practice Vodou (a blend of African and Caribbean spirituality) and a good number combine the two. The main language of Haiti is Haitian Creole, or Kreyol, which combines French-derived vocabulary and African grammar. It evolved as a common language amongst the various peoples who were brought to Haiti as slaves. French is the language of education and things official, and 40% of the people speak it. Typical Haitian foods include sos pwa (black bean gravy), piklis (Haitian kimchee) rice and bean dishes, fish and meats like chicken and pork. Spaghetti with ketchup is often eaten for breakfast, and a warm corn custard called AK100 is a popular snack. Carnival is held in February leading up to Mardi Gras and features parades, decorated floats, costumes, masks and much music. Haitian music includes traditional styles like vodou, zouk, rara,twoubadou, and mizik rasin, or the more contemporary rap, compa and merengue. Haitian art is vibrant and can be seen in such forms as intricately cut metalwork, paper-maché sculpture, and bright paintings of markets and landscapes. The colorful buses and pick-up-taxis that fill the streets, are known as tap-taps, are moving works of art. Haiti has lots of popular local comedians and imports are enjoyed too, especially that zany clown, Mr Bean.